Shinagawa Station is among the oldest train stations in Japan, having opened its doors in 1872. Interestingly, the station became operational four months prior to the inauguration of the first railway in Japan. While none of the original structure remains, Shinagawa Station continues to play a role in the rail history of Japan. The introduction of the Shinkansen bullet trains to Shinagawa helped alleviate the congestion of other busy Tokyo stations. In less than a decade, Shinagawa will be among the first stations in the world to host the innovative, gravity-defying maglev train. 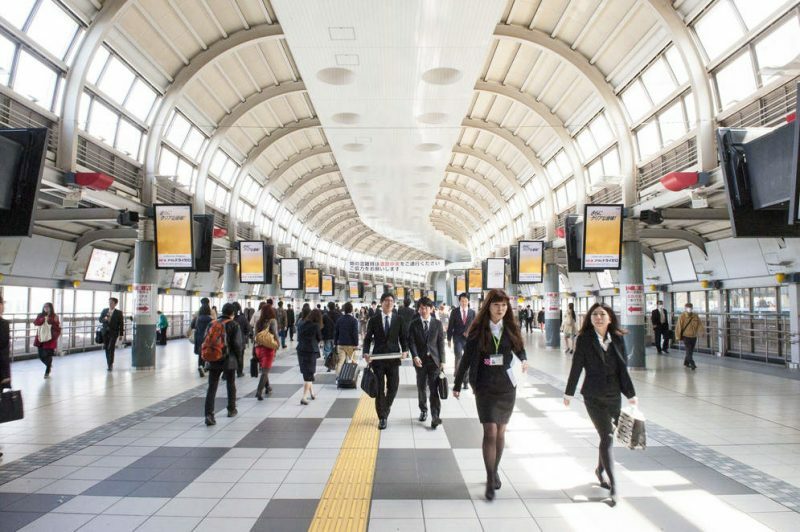 What do you need to know about Shinagawa Station? This handy travel guide is here to help make your travels smooth and worry-free. Your Japan Rail Pass makes travel simple and affordable. In Shinagawa Station, you can use it to access a number of Japan Railways lines, including the Tokaido Shinkansen. At the JR office in this station, you’ll also be able to activate your pass and make your seat reservations. If you’re taking the Shinkansen bullet trains through Tokyo, you will likely be making a stop at Shinagawa Station. It is the first stop on the Tokaido Line from Tokyo Station to Nagoya, Kyoto and Osaka. The Nozomi, Hikari, and Kodama trains run on this line. Shinagawa Station will also be the terminal station from the Chuo Shinkansen, a maglev train line scheduled to become operational in 2027, with a new station between Shinagawa and Tamachi stations. The Yamanote Line, a loop line that provides transportation to many of Tokyo’s major train stations and attractions. For example, Meguro Station is just 3 stops away from here. The Keihin-Tohoku Line to Tokyo Station, Ueno, Omiya, Ofuna, Kawasaki, Yokohama, Sakuragicho, and Isogo. The Tokaido Main Line to Tokyo, Ueno, Omiya, Utsunomiya, Takasaki, Hiratsuka, Odawara, Atami, Ito, Izukyu, Shimoda, and Shuzenji. The Yokosuka Line to Tokyo, Chiba, Funabashi, Musashi-Kosugi, Shin-Kawasaki, Yokohama, Ofuna, Kurihama, and the Narita Airport. The Ueno-Tokyo Line, to Iwaki on the Limited Express Hitachi/Tokiwa, as well as the Joban Line Rapid for Toride, Mito, and Narita. The Narita Express to Narita Airport. 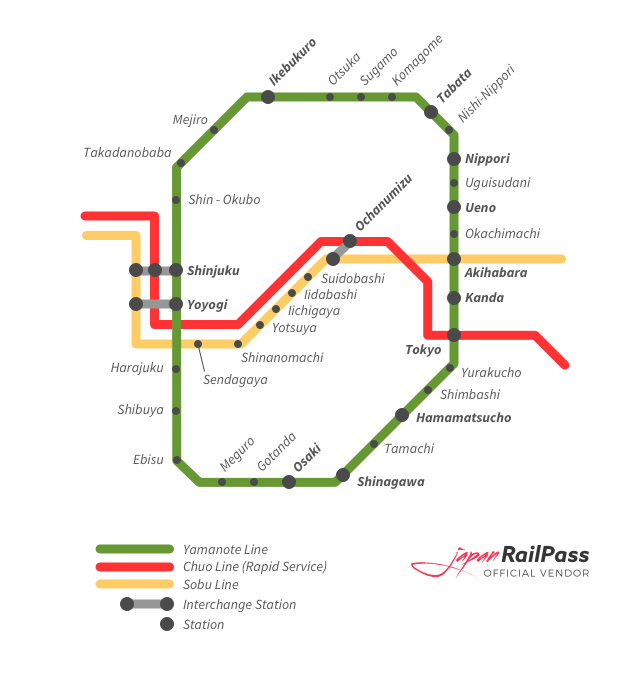 While not covered by the JR Pass, the Keykui Lines provide ready access to Yokohama, Miura’s Peninsula, Kitashinagawa, Samezu, Misakiguchi, Imba-Nihon-Idai, Sengakuji, Uraga, Haneda Airport, and Narita Airport. Local trains run in the mornings. Unlike many large stations, Shinagawa Station has only two entrances and exits. On the west side is the Takanawa Exit, and on the east side, the Konan Exit. Within the station, a long corridor connects these exits, dividing the station in half. The station has two floors, these also being designed for ease of use. The JR and Shinkansen platforms are located on the first floor, while the Keykiu platforms are located on the second floor. A JR ticket office is located near the station’s center, in the Main Hall, where you can exchange your JR Pass and make your seat reservations. Coin lockers are abundant on the northern side of the station, and restaurants within its southern half. Bus stops are located on two sides of the station. The eastern bus stop allows access to limousine buses. Bus lines include Toei Bus, Keikyu Bus, Tokyu Bus, and the Airport Transport Service. Taking the western Takanawa exit, you will have access to many restaurants and hotels, including the Takanawa Keikyu and Tobu Hotels, the Grand Prince Hotel Takanawa, and the Shinagawa Prince Hotel. The Epson Aqua Stadium can also be found here. When departing the eastern Konan Exit (you can get some ekiben beforehand) you will find the Atre shopping center as well as the offices and restaurants of the Shinagawa Intercity complex. The Tokyo University of Marine Science and Technology can be found nearby. With your JR Pass in hand, you are ready to explore all that Tokyo – and Japan – has to offer. Where will your travels take you? Start planning your next adventure today. Hi July! The Joetsu Shinkansen, included in the JR Pass, takes you directly from Tokyo to Gala Yuzawa location on the Niigata prefecture, in just two hours. Happy travels! Hi Ken! To get from Tokyo to Osaka, you will need to take either the Hikari bullet train or Kodama from Tokyo or Shinagawa stations in central Tokyo. Both run on the Tokaido Shinkansen line, connecting the two cities. This trip is fully covered by your Japan Rail Pass. I’ll be going from osaka to tokyo, is the shinkansen(kodama,hikari and sakura) will be stopped at Shinagawa station? Yes, the Hikari and Kodama Shinkansens between Osaka and Tokyo will stop at Shinagawa Station. I’ll be going from Kyoto to Shinegawa on the Nozomi on April 6. I then need to transfer to the Narita Express. Please tell me on which platform I’ll arrive at Shinegawa from Kyoto, and to which platform I need to go to get the Narita Express. This will be my first trip to Japan and I’ll be traveling alone! The JR Pass is valid on the Kodama, Hikari and Sakura types of Shinkansen, but is not valid on the Nozomi and Mizuho classes. The Narita Express has a stop in Shinagawa so it should be easy for you.